An Australian wildlife carer has suffered a punctured lung as she and her family fought off a savage attack by a kangaroo at their property. Linda Smith, 64, and her husband Jim were feeding kangaroos hit by drought conditions in Queensland when the 6ft (1.82m) grey turned on Jim. The couple and their son fought off the attack, said by wildlife officials to be rare, with a broom and a shovel. The animal hopped off into the bush before emergency services arrived. The incident occurred in Millmerran, about 80km (50 miles) south-west of Toowoomba in Queensland. Speaking from hospital, where the couple are both being treated, Mrs Smith told the Brisbane Times that some 30 kangaroos and wallabies usually arrive each night to be fed because of the drought, and are given grain and chaff. She said: "This one kangaroo came in and I thought it was Golly Gosh, one of the kangaroos we have raised. He was a huge grey, would have been at least 6ft." As her husband, also in his 60s, fed the kangaroo it turned on him. "Jim was on the ground and the kangaroo just kept at him," Mrs Smith said. She fetched a broom but the kangaroo knocked it out of her hand and attacked her too. "Then my son came out to try and help me and hit him over the head with a shovel," Mrs Smith said. She suffered a collapsed lung, broken ribs, abrasions to her arms and legs and other internal injuries and underwent surgery on Sunday. Her husband suffered multiple lacerations while her son, 40, had minor injuries. Queensland Ambulance Service senior operations supervisor Stephen Jones told Agence France-Presse such a vicious attack was "something that I haven't come across in my 30-odd years in the service". He said if Mrs Smith had not intervened to help her husband, "the outcome may have even been death". 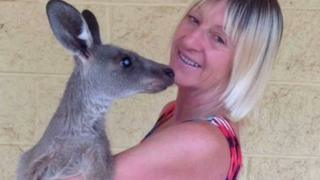 Mrs Smith, who has been caring for animals for 15 years since finding an orphaned joey, said: "I don't want this kangaroo to be hunted down and killed, I love animals."